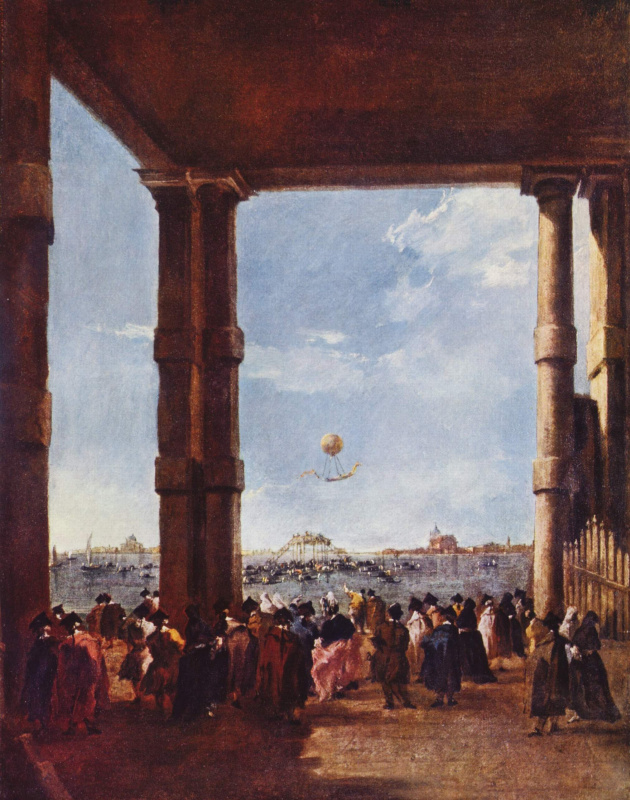 creativity was in the shadow of his brother, Francesco Guardi, and became known only thanks to modern research, meanwhile, he was still alive, enjoyed great popularity. He was a member of the Academy since its inception (1756), perhaps on the recommendation of his brother-in-law George. 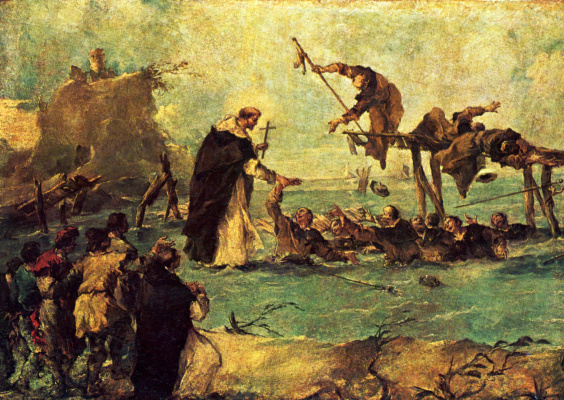 B. Tiepolo. Between 1730 and 1745, by order of Marshal Shulenberga, it takes a lot of copies of paintings by famous artists (Veronese, Ricci, Solimene, L. M., vanloo), among which was "the last supper" (S. Ricci, Seal Museum), portraits of Philip V. Elisabeth Farnese, Ferdinand Spanish (L. M. vanloo, Hannover, collection of Culemborg), "Alexander the great at the body of a murdered Persian king Darius" (Danetti, Moscow, Museum of fine arts. A. S. Pushkin). 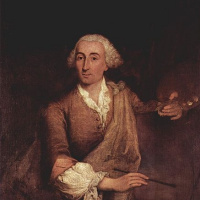 His other works caused great controversy, according to most researchers, the author of many paintings depicting human figures, which once was attributed to Francesco Guardi, was Gianantonio and Francesco acted only as an assistant. Thus. Gianantonio, was assigned the song "the Death of St. Joseph" (subscription, Berlin, Bode Museum), the altar painting ".Madonna with saints" (C. Vigo d Anaunia inspired Solimeno: TS. in Belvedere di Aquileia, inspired by S. Ritchie, in the C. in cerete basso, executed under the influence of Pasiano). decorative panels ["Aurora". "Neptune", "Mars", Venice, Cini collection), heavy works ("Turkei"), Lugano, collection Thyssen-Bornemisza) and cycles, illustrating the "Osvobojdenie Jerusalem" (London. private collection), a scene from Roman history (Oslo, Villa Bogstad), or "Joseph's Story" (Milan, private collection). 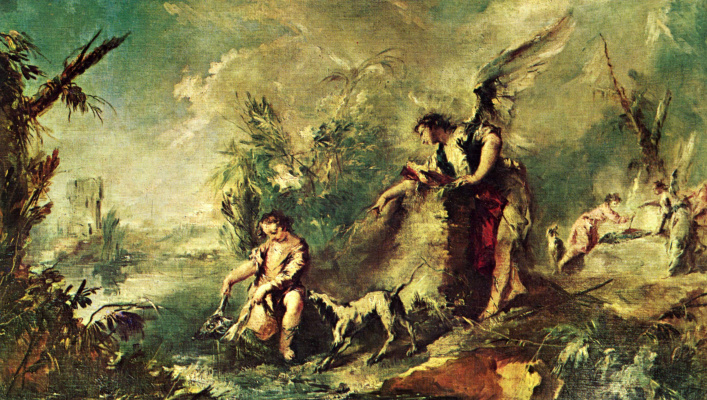 According to some scholars, he also performed one of the masterpieces of Venetian painting of the XVIII century — "Healing of Tobit" which adorns the body in TS. Angelo Raffaele in Venice. Interestingly, most of these works are variations, more or less free, with themes borrowed from contemporary artists or old masters; however, because of the scenic imagination and virtuoso technique, Gianantonio has created a completely original work. 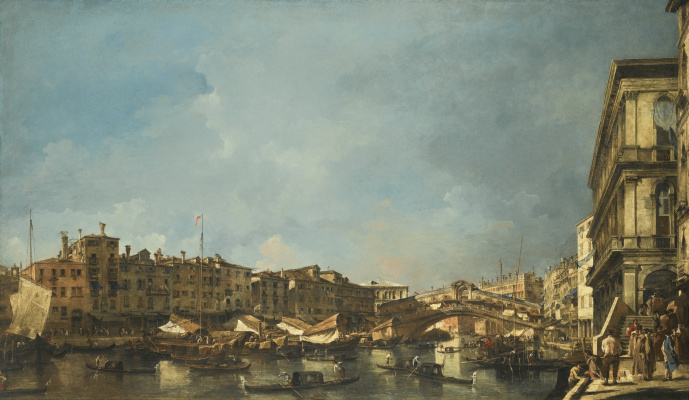 GUARDI Francesco (1712, Venice 1792. ibid) His early work is inseparable from the activities of his brother, Gianantonio, who was much older than Francesco, and managed the well-known Venice Studio. Originally Francesco worked together with him, then more obsolesce, and when Gianantonio died, in turn, headed a family workshop. Like his brother, Francesco started with paintings depicting human figures or stories, but soon discovered a subtle sense of atmosphere that connects the characters and the surrounding landscape. 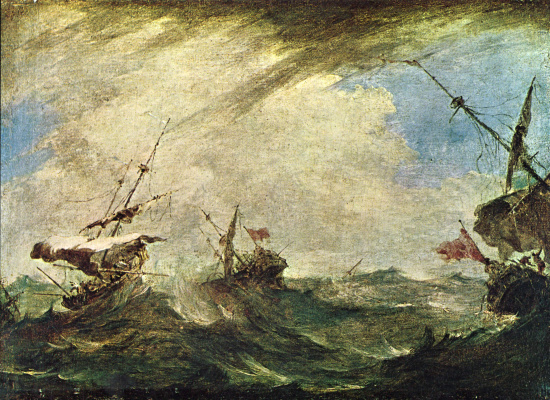 These traits are characteristic for early works such as "Faith" and "Hope" (1747, Sarasota, Ringling Museum), in which the figures seemed to stand in awe of the vast and brightly lit landscape, but also for the later "Miracle of St. Dominicans" (CA. 1763, Vienna Museum of art history), space as it vibrates, and small figures are included in the agitated atmosphere. Here the problem is one that has generated a lot of debate: who of the two guards must be ascribed the authorship of the "Healing of Tobit" in TS. Angelo Raffaele in Venice? Free "impressionist" texture, vibrant atmosphere, bringing together figures with the landscape, the bright flashes of red colors — all this is undoubtedly reminiscent of the famous Veduta Francesco. Not only in Venice, but throughout Europe, guards became famous as vedutisti. In his early works he is influenced Marco Ricci ("Pazartesi", to 1750. Saint Petersburg, GOS. 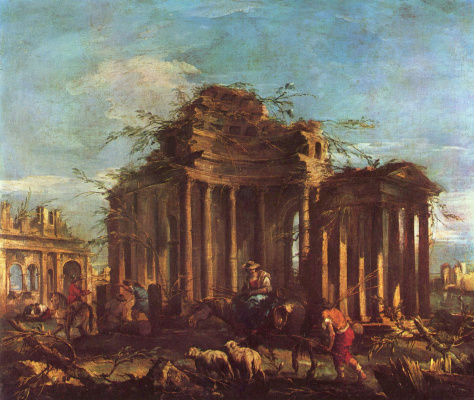 The Hermitage), and later Canaletto. However, while using the schemes of Canaletto, he gives to his Venetian types completely different mood ("Piazza Sanmarco", London, NAT. Gal.) "color plays a new role, softening the light" (Pallucchini). A series of "festivals", the plot of which is borrowed from prints of Brustoloni (1766), dates to around 1770 (Paris, Louvre, Brussels, Cor. Museum of fine arts, Grenoble, Museum of fine arts). 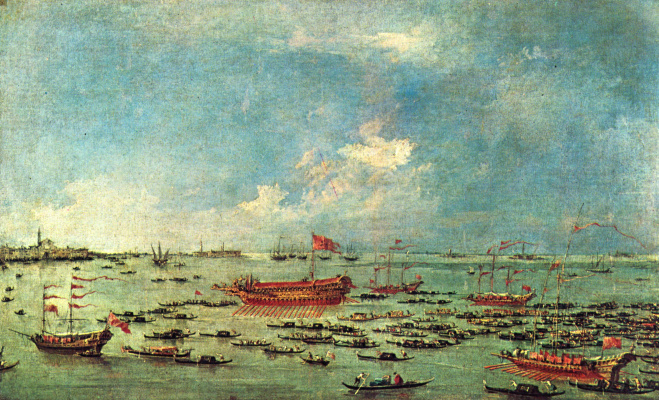 These paintings represent "types", which accurately reflected the real historical events (celebrations in honor of the Duke motto, IV Mocenigo, in 1763). However, the plot is only the pretext for a magnificent and unusual description of Venice, transferred with a wide sense of space and Golden light; dynamic images lose their architectonic monumentality and converted, by calling in the memory of a fabulous and fleeting vision. 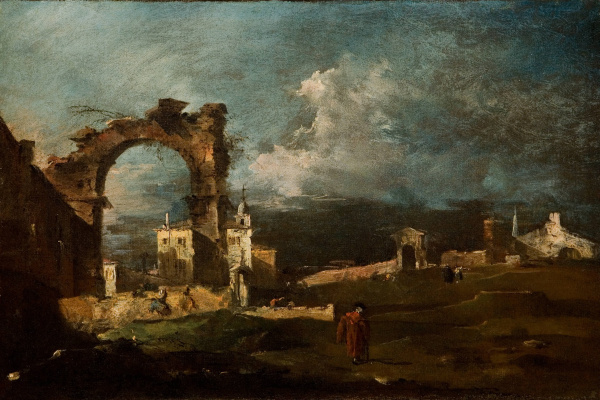 These "types" are interspersed in the works of Guardi from the famous "Capricci", which with its light and lightness are very different from the manner of Ricci. 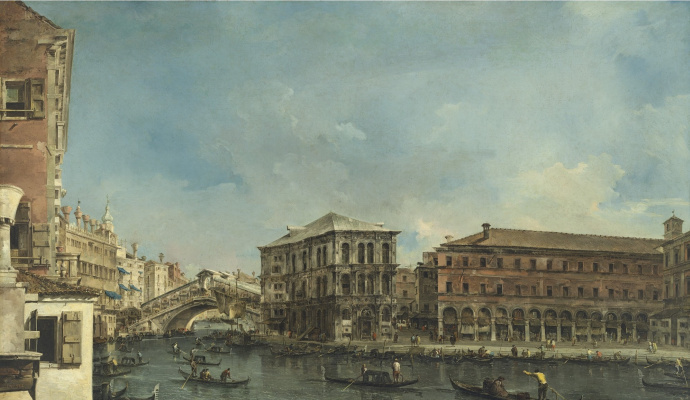 In "Capriccio on the lagoon" (new York, Metropolitan Museum), greatly expanded under rainy skies, the hand of the artist lingers on the sails patched and cracked walls, connecting reality and fantasy. 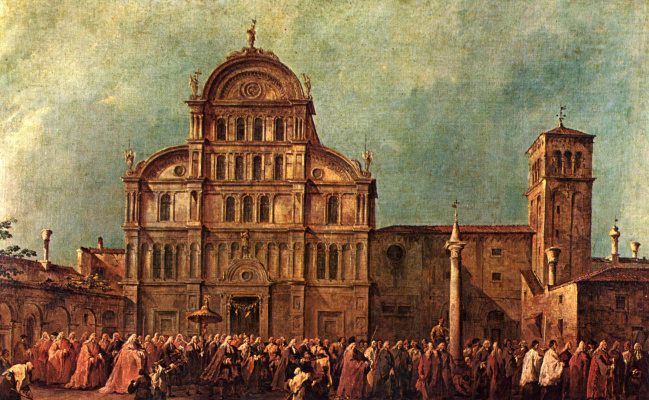 In 1782 in two series of works by Guardi has once again shown himself as an official artist. First performed on the occasion of the stay in Venice of Grand Duke Paul Petrovich and his wife Maria Fedorovna, designed in tones green and brown tones, vibrant, indirect light and vibrating (forms ("Gala concert", Munich, Alte Pinakothek). In the second series, written in honor of Pope Pius VI, a fantastic perspective of the interior gives the impression of a fascinating emptiness, and the silhouettes of figures are painted in twilight shades ("Mass in kg. San Giovanni e Paolo" (Cleveland Museum). For late style guards are often lonely and melancholy that was expressed in his faded palette. "Capricci" (Florence. The Uffizi) matter like decomposed from the poignant and poetic nostalgia. Creativity Guardi is enormous (more than thousand pictures). In the major European and American museums are his views of Venice and "Capricci" (Milan, Museo Poldi Pezzoli, Lisbon, Gulbenkian Foundation; London, NAT. Gal. ; New York, Metropolitan Museum of art; Vienna Academy; Lugano, collection Thyssen-Bornemisza; Bergamo, Accademia Carrara). 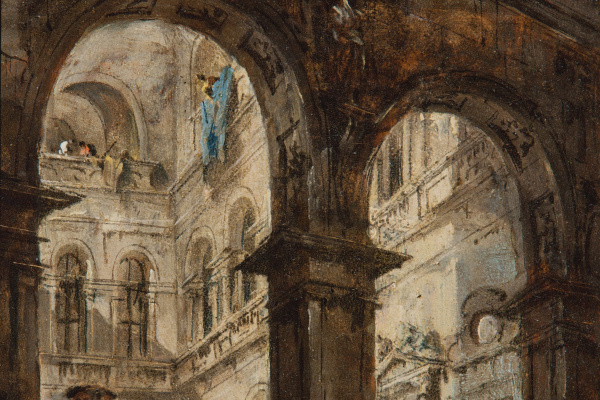 Graphic artist’s legacy includes sketches of scenery, silhouettes ("macchiette") and city types; even in these watercolor feather or the paintings of Guardi reaches a certain lighting effect and vibration.